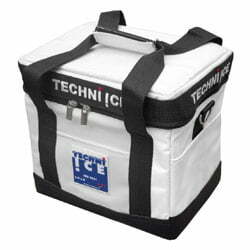 For decades, Techni Ice cooler has been the #1, most popular ice chest manufacturer in Australia. Consider them the Australian version of YETI, only better quality. The brand’s relatively new Signature Series is considered by many outside the US to be the best ice chest in the world – the only problem is hardly anyone over here has ever heard of them. The cooler’s won top ice keeper awards in both Australia and New Zealand, and has a couple of revolutionary design features that help it outperform just about anything that we’ve seen here stateside. 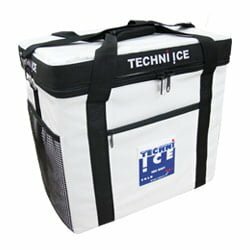 If you’re in the market for one of the best, most durable coolers on the planet, you definitely need to know about Techni Ice. Techni Ice Cooler Review: What Makes Them Different? The main thing that sets Techni Ice coolers apart from big names like YETI and K2 is the fact they have almost double the insulation. The insulated walls on a YETI are about 2”, while the average thickness on a Techni Ice is about 3.9”, with 3.5” thick lids. TIP: Find out how to maximize ice retention using some of the best ice packs for coolers. Construction-wise they’re built with the same rotomolding technique as everything else, where a liquid polyethylene is injected into a mold and then rotated until it cures/hardens completely, before being injected with a polyurethane insulating foam. Another reason why ice lasts so much longer in a Techni Ice is the fact that they’re raised off the ground. 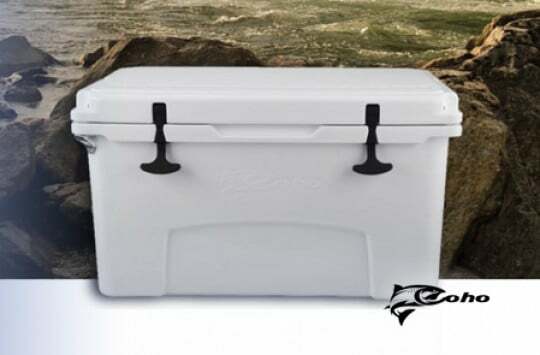 YETI’s and every other rotomolded cooler we’ve ever seen before is flat on the bottom and rests on the ground – the problem with that is heat from the ground easily transfers up into the bottom of the cooler. 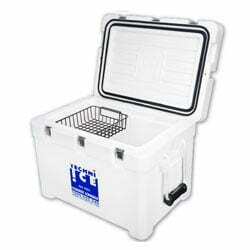 In a Techni Ice Box, the entire cooler body is isolated from the ground, giving the ice chest its own little microenvironment and allowing it to maintain its internal temperature for a much longer time. 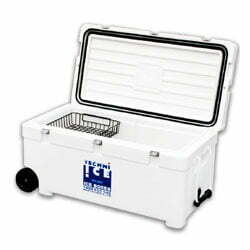 Additionally, Techni Ice is the only rotomolded cooler we’ve see that has dual Air-Locking seals; instead of one rubber gasket like every other ice chest, it’s got two – one of them an industrial refrigerator seal and the other a flex seal. 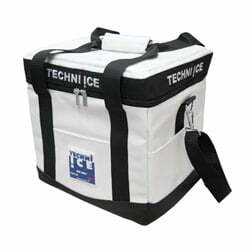 The main culprit of ice loss in a cooler is air transfer between the inside of the ice chest and the outside air – with Techni Ices system, air transfer is nearly cut in half compared to other brands. In addition to their design innovations, Techni Ice also includes some basic integrated features with each cooler that make them a better value – in our opinion – than other top cooler brands like YETI and Pelican. 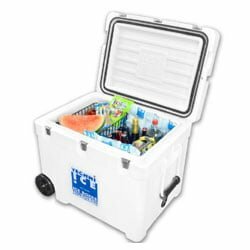 For one, each ice chest comes standard with a removable basket (these are usually expensive and sold separately with other brands), and they also include a divider that slips into grooves on the inside of the cooler to keep your goodies separated. 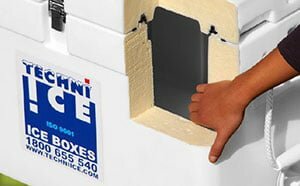 Another cool feature of Techni Ice ice chests is that they’re 100% flush – everything from the insulated drain plug (another nice innovation) to the handles to the lid latches are fully recessed into the cooler body, giving it 360-degrees of totally flat surface to pack around. 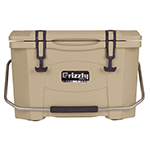 Also, the coolers are certified bear-proof, and they’ve got fully integrated flanges for secure tie down or for putting a padlock on – an absolute must for any premium ice chest. 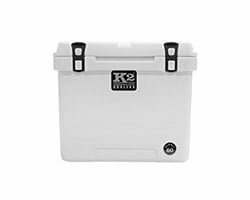 Durability-wise, these coolers are as tough as anything we’ve ever seen before, and we have no doubt they can withstand the extremities of whatever outdoor situation you’ll throw at it. Put it this way – if they’ve proven for years and years that they can withstand the extremes of the Australian Outback, they can surely withstand anything you could toss at it over here. 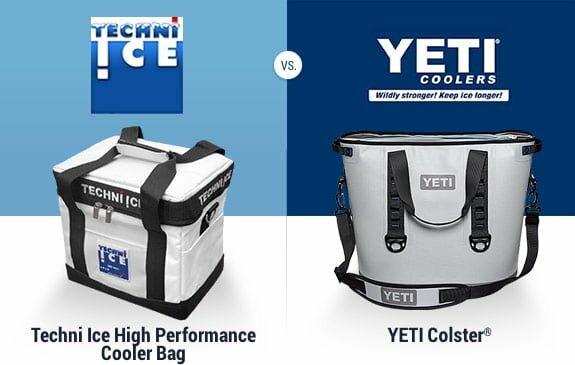 In addition to their Signature Series rotomolded coolers, Techni Ice also has a pretty nice soft cooler that’s comparable to YETI’s Hopper bag. 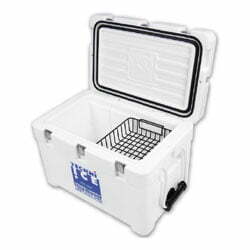 90-quart and 111-quart coolers come with heavy-duty integrated wheels (more coolers with wheels here). Techni Ice doesn’t have a ton of sales yet here in the US, but every review they’ve gotten so far has been 5-star on Amazon. People are absolutely loving the low prices, and have been blown away how quickly the coolers arrive after ordering. (If they become anything like RTIC, you might want to act quick and order one for yourself now before they become backordered with a 6-month wait list). Also, plenty of people have said they replaced one of their big-name performance coolers with a Techni Ice, and that there’s absolutely no comparison in performance. Techni Ice vs YETI – Has YETI Finally Met Its Match? 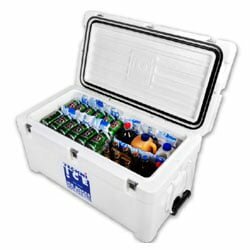 We’ve already discussed most of the major upgrades that Techni Ice coolers have over YETI’s, such as nearly double the insulation and dual-locking seals. Another thing that we really like about Techni Ice Boxes is their oversized drain plugs – they’re 2” wide compared to YETI’s ¾” garden hose-size plug, so you can drain water out of them in the blink of an eye instead of having it just trickle out. Also, the plugs on Techni Ice’s are fully sealed and insulated, unlike the YETI ones which just have a flimsy rubber o-ring on them. 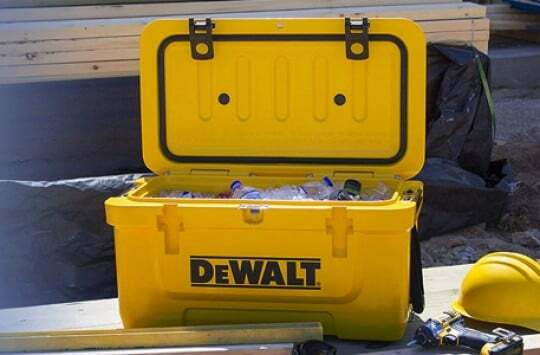 As far as build quality, the two coolers are actually very similarly built considering their rotomolded construction, integrated hinge system, and heavy-duty rope handles. We actually kind of like the stainless steel latches on the Techni Ice coolers compared to the rubber T-bands on YETI’s, as we’ve noticed the YETI ones will stretch and wear down over time, affecting their ability to seal the lid properly. 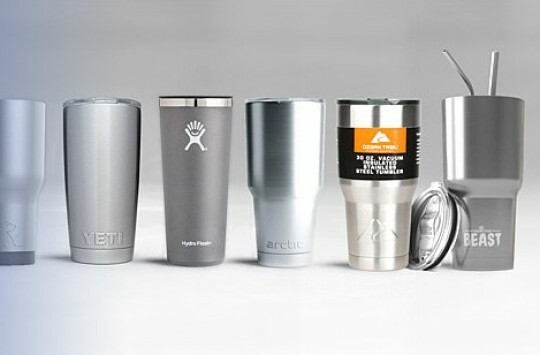 Everyone knows the quality of a YETI, and we definitely have no intention of devaluing them. 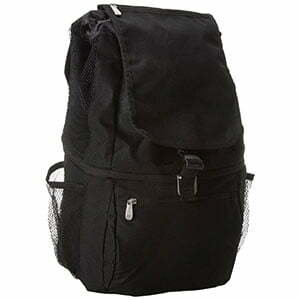 However, when we happen to come across a product that’s superior, we have no problem admitting it. 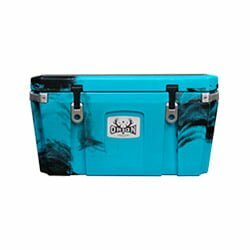 Bottom line is, there’s no getting around the fact that YETI is the coolest, trendiest, most popular cooler brand in America – they make fantastic coolers, and their reputation speaks for themselves. 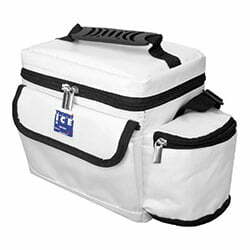 However, Techni Ice coolers are better-insulated, hold ice longer, and most important of all – they’re way cheaper than a YETI. From a pure value standpoint, we’d choose Techni Ice over YETI any day. Like we mentioned earlier, Techni Ice also has some pretty nice soft-sided coolers in addition to their rotomolded lineup. They’re not quite as nice and sleek-looking as the YETI Hopper (which we’re big fans of), but just like their hard coolers, they’re really nice quality and they’re a lot less expensive. 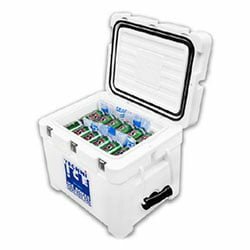 They’re built with a really tough 600D ripstop nylon, and just like the Techni Ice ice chests, they have nearly double the foam insulation as competing brands. They’ve currently got four different sizes available, and are for sale at pretty amazing prices between about 30 and 70 bucks. Another incredible value for the price, and light years cheaper than the Hopper. If money and price weren’t a consideration, we’d go with the Hopper as they look a cooler, and are a better-quality soft cooler overall. However, considering the MASSIVE price difference between the two compared to the relatively marginal difference in performance, common sense and sensibility tells us to go with the Techni Ice instead. If you’re wondering where to buy Techni Ice Box coolers, you’ll have the best luck finding what you’re looking for on Amazon – they’ve got by far the best selection of the Signature Series in-stock, and they offer free shipping on every model. Also, it’s Amazon so you can trust it to come from a reliable source, and returns are super simple if you need to return it for any reason. If you can’t find the size/model you’re looking for on Amazon, you can always try the Techni Ice website directly, but from what we’ve seen and heard their USA site has been selling out quickly. Well, hopefully this Techni Ice cooler review has helped shed some light on their coolers here stateside – if you’re a cooler geek like us and you’ve never heard of them, you’ve been missing out. Excellent quality coolers with the best insulation on the planet, and cheaper than YETI’s… it’s only a matter of time before they take off like wildfire.